I've been badgering Mark Freeth about CoC for about a year now, first of all to do it in 20mm, then of course its turned into 28mm. Meanwhile, The group of lads from Huntingdon who do an annual game to remember their sadly missed old friend Carlo were coming to Basingstoke. I thought that for 8 players, a Big CoC campaign of 4 games over the weekend from Friday night through to Sunday afternoon would work fine. I allowed for an extra scenario just in case things went a bit quick. 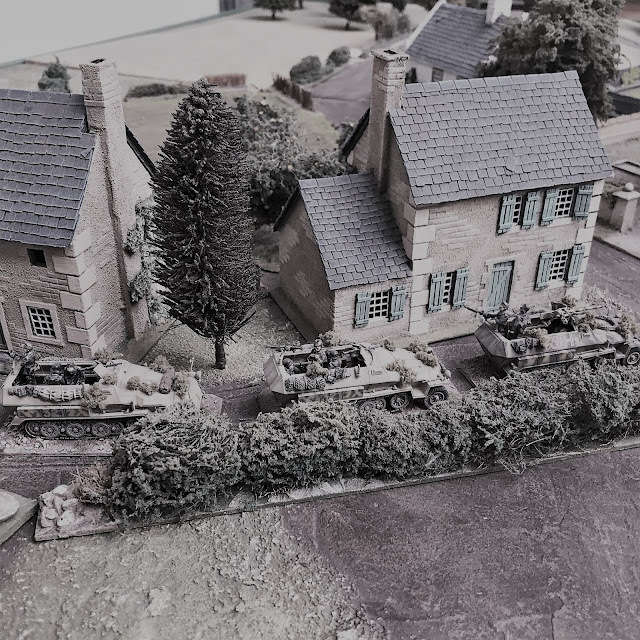 An obvious choice was Normandy, I had all the kit required, and of course, Mark has his amazing collection of Mick Sewell buildings which were aching for a run out. 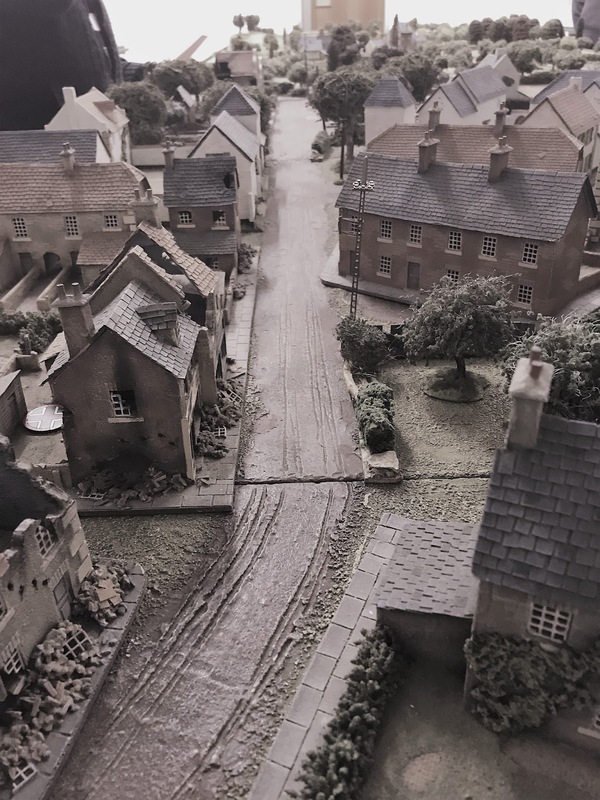 I only needed a reinforced company for both British and Germans, plus various AFV options, all of which we had. 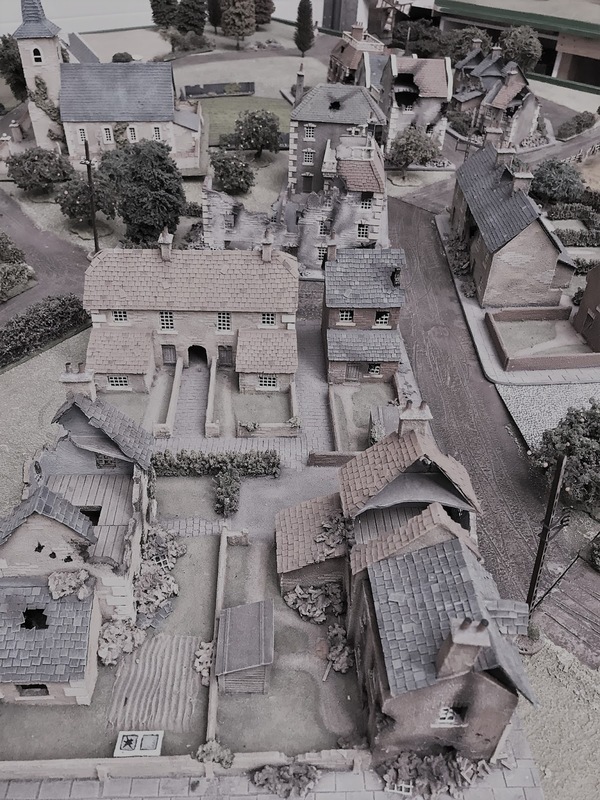 The scenario was to be the action at Gavrus on 29/30th June 1944, when the 2nd battalion Argyll and Sutherland Highlanders came under ferocious attack by the 10th SS 'Frundsberg' division. 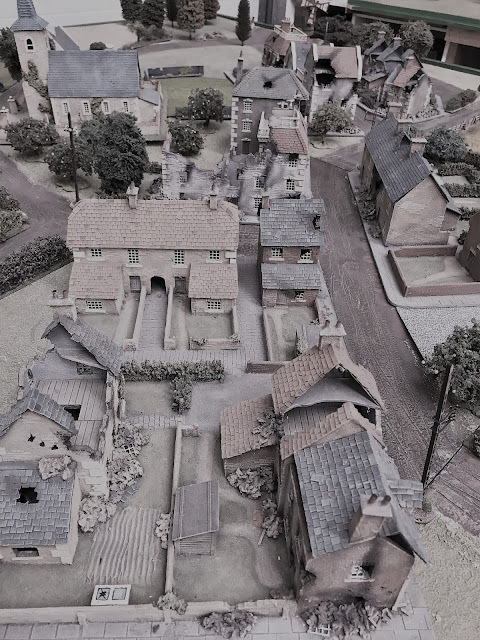 The battle is reasonably well documented, particularly in Iain Dalglish's book "Operation Epsom: Over the Battlefield" which includes some fantastic aerial photographs of the area taken just days after the battle, these would substitute perfectly for maps. 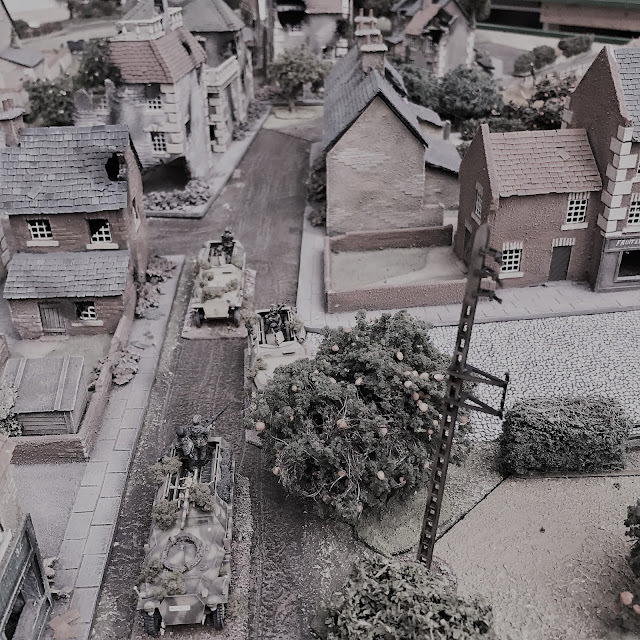 The first was a bit of a "what if" with infantry companies from each side recce-ing the village of Bougy about a mile South of Gavrus, the Germans supported by an armoured infantry platoon in half-tracks and the jocks by their carrier platoon. Both sides did recce Bougy, but I doubt they did it in such strength or necessarily at the same time, but I thought it would give a good introduction for the players, and set the tone for the weekend. This depicts the action between The 2nd Argylls and the 10th SS Frundsberg Division early in the morning of 29th June 1944, around the village of Bougy. This is a patrol action as per the main CoC rules. National characteristics as per the main rules. 7 Patrol Markers will be placed along the respective baselines, resulting in 6 Jump off Points. Vehicles will enter via the Gavrus road. Casualties from scenario 1 will carry over to scenario 2. Lieutenant: Senior Leader armed with a pistol. 2” Mortar Team: 2 men. 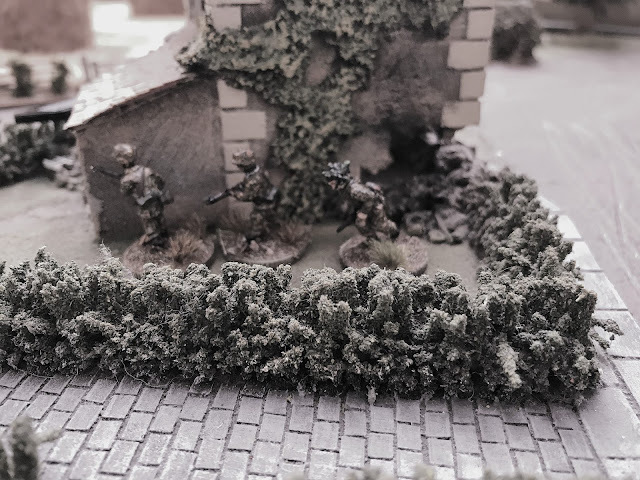 List 2: PIAT Team: 2 men, 2” Mortar Team: 2 men. List 3: Sniper Team, Universal carrier Bren Team with Junior Leader. ELEMENTS, CARRIER PLATOON, 2ND ARGYLLS: , Regular, 5 command dice. 7 Patrol Markers will be placed along the respective baselines, resulting in 6 Jump off Points. The adjutant may either: Act as an off table senior leader for 1 platoon. OR for the entire company, in which case he will just add +1 to their deployment rolls. Obersharfurher: Senior Leader armed with a SMG. List 3: Sniper Team, Panzergrenadier team: Junior Leader armed with SMG, 5 riflemen. 1 x Sdkfz 251/10 + Obersharfurher: Senior Leader armed with a SMG. *Superior regulars treat a single 6 on their command dice as a 5. Other rolls are unchanged.